The Taxpayers’ Union has accepted a settlement and apology from Local Government New Zealand President Dave Cull relating to public statements he made about the accuracy of the Taxpayers’ Union’s local government league tables, ‘Ratepayers Report’, and honesty of the organisation. While we make no apology for our research being hard hitting and won’t shy from controversy, we take allegations concerning our honesty very seriously and take pride in our research being accurate and reliable. In this case, Mr Cull’s comments, published by LGNZ, some of its member councils, and the Dominion Post, were demonstrably wrong. He got the basic facts totally wrong. The only material error, which we will be making further comment on later today, was caused by Auckland Council providing incorrect information under the LGOIMA. No one knew of that prior to Mr Cull’s comments, and any dishonesty was at Auckland Council, not at the offices of the Taxpayers’ Union. We have accepted Mr Cull’s apology and modest financial payment as full and final settlement of this matter. On 23 August I wrote an opinion piece regarding my concerns about the quality and utility of Taxpayers' Union 2017 Ratepayer's Report. The Taxpayers' Union has objected to two sentences in the piece, which referred critically to some ratepayer analysis work conducted in 2014. I said: "The organisation got its first attempt at this data fundamentally incorrect in 2014. There were so many errors the material was withdrawn". The Taxpayers' Union has now told me that its 2014 work was taken down because it was out of date, not for any other reason. It has also pointed out that LGNZ's critical review of ratepayer analysis in 2014 related to work done early in 2014 by an independent person, rather than the later Taxpayers' Union’s 2014 Report. As a result, I have asked the Dominion Post to delete from the opinion piece the references to work undertaken in 2014. LGNZ apologises to the Taxpayers' Union for any confusion. The Taxpayers’ Union expects to make no further comment on this matter. Well known former Wellington lobbyist and former journalist, Barrie Saunders, has been appointed to the board of the New Zealand Taxpayers’ Union. Barrie retired from the government relations consultancy, Saunders Unsworth, in March 2015, after 25 years as a government relations consultant. The company specialises in the management of public policy issues on behalf of its clients, which are predominantly business organisations and corporates. As a government relations consultant, he worked for corporates, groups of corporates and industry organisations including: fishing, used vehicle imports, pharmaceutical advertising, meat, pipfruit, timber, institutes of technology and polytechnic and the New Zealand Business Roundtable, a free market think tank. Barrie was the executive chairman of the 14 member Port CEO Group, a virtual organisation from 2002 to 2015. He was President of the Wellington Regional Chamber of Commerce 2000-2002 inclusive, is now a life member of the Chamber. Chairman of CBL, the Chambers investment company 2003/9. He was a trustee of the Wellington City Mission 1999/2006 and a member of the Housing NZ Board 1994-97. In 2011 he was appointed a director of TVNZ and completed his second term on April 2017. Prior to establishing his government relations business in 1990, Barrie worked as a journalist (radio and TV in New Zealand, Australia and the UK), and the National Business Review, of which was the founding editor in 1970. He later worked in public relations. He was press secretary to the Labour Party Leader Bill Rowling (1976-79), Public Relations Manager for the Manufacturers Federation (1979-83) and Public Relations Manager for the NZ Meat Producers Board 1983-86. He was the Board’s North American Director based in New York from 1986 to the end of 1989. A print quality, royalty-free, photo of Barrie is available here. For the first time ever, the ACT Party is the biggest spender in this week's update of the election Bribe-O-Meter. ACT’s big jump is on the back of its education policy, costing $3 billion over the next parliamentary term. This week the Bribe-O-Meter also sees Labour and the Green Party jump by more than $1 billion and National by approximately $0.5 billion. ACT has announced a $1 billion per year increase in teacher funding. However, when combined with their other policies such as removing corporate welfare and a cancellation of Budget 2017 welfare increases, ACT’s total package would reduce net government spending by $2.4 billion over the next three years. That’s $1,407 per household. The Labour Party continues to steadily push the fiscal boundaries, with total new spending over the next three years now at $22.8 billion. $22.8 billion is equivalent to $13,237 per household. This week’s new spending came primarily from bringing forward free tertiary education by one year and increasing the student allowance by $50 per week. These two policies will cost taxpayers $2.4 billion over three years. Although it should be remembered that the zero fees policy will be much more expensive once it comes into full effect in 2024. The Green Party has announced a string of environmental policies, with a particular target on farmers. A new nitrogen tax will raise $392 million over three years, accompanied by a $20 million per year increase in funding for sustainable farming and $5 million a year to establish an organic farming certification scheme. However, the Green Party have also promised to cancel all future unappropriated irrigation subsidies so some of this new spending is offset. We have estimated that cancelling these irrigation subsidies will save $280 million in the next three years. Major announcements this week from National included $62m to crack down on meth, $52m to go towards Predator Free New Zealand, and an extension of paid parental leave to 22 weeks at a cost of $205 million over three years. Labour has similarly proposed to increase paid parental - from 26 weeks instead of 22 - costing an estimated $420 million over the next three years. Following on from Jacinda Ardern's announcement today of Labour's tertiary education policy offering 'free' university study for up to three years, we have released a briefing paper examining whether "zero fees" university really is what the left say it's cracked up to be. We find that the implementation of a zero fees policy for tertiary education would reach into the pockets of the disadvantaged, to line the wallets of the future’s wealthy. Contrary to claims that zero tertiary education fees help the poor, we found that similar policies overseas have led to job shortages in crucial areas, and poorer quality courses. In Scotland, which introduced zero fees in the early 2000's, students from low socio-economic groups were the first to be shut out. This contradicts the political ideology of those who advocate for it, because the policy hampers social mobility, and actually increases barriers to reducing inequality. The costs of such a policy are borne by low and middle-income earners, to help tomorrow's rich get a free ride." Fully implemented, Labour's proposal would increase that cost by $852.57 per year. less social mobility and entrenched income inequality. Download the PDF report from here. Hard copies are also available for members of the Taxpayers' Union, on request. 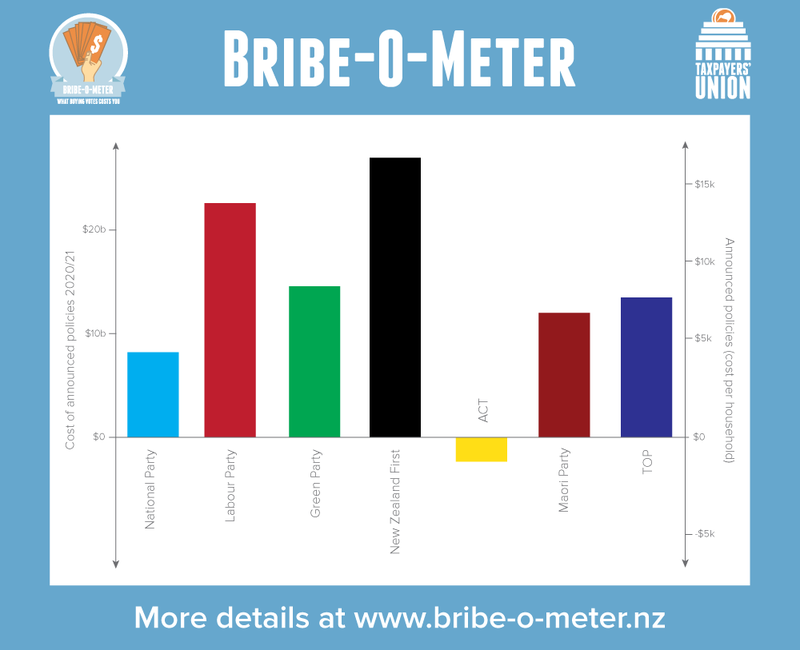 Big spending packages targeted at New Zealand’s major cities account for the majority of the increases in the latest update of the Bribe-O-Meter. 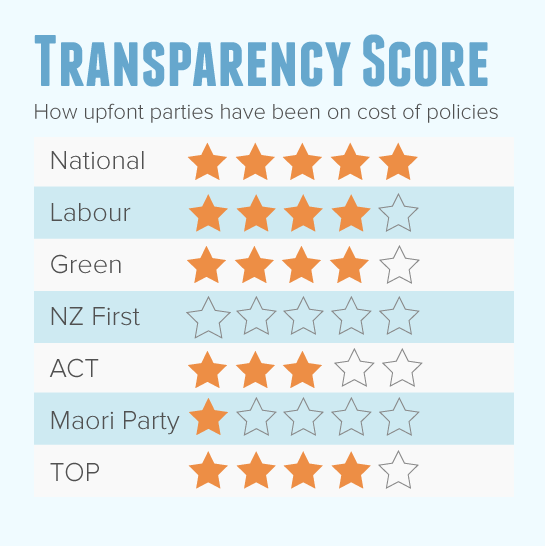 Labour has been the most ambitious with expensive new packages targeted at each of the major cities, with other smaller promises from National and the Green Parties. In the last week the Labour Party announced new spending packages targeted at the four largest cities. $300 million for a Christchurch Capital Acceleration Fund, $100 million for transport investment in Christchurch, $30 million for the Auckland Skypath, $22 million for a new rail line between Upper Hutt and Trentham and a renewal of the $100m Urban Cycleways Fund. Labour has also committed to building a new Dunedin Hospital. However, unlike National’s proposal, they will not make use of a Public-Private Partnership. Labour claims their Hospital will cost the same as National’s – approximately $1.4 billion over seven years. The Bribe-O-Meter has taken Labour’s costings as being accurate, although this is questionable given the historic efficiency advantages that public-private partnerships have over Government builds. The total cost of these targeted packages is in excess of one billion dollars over the next three years. Labour’s total new spending in the next term is now $20.4 billion, only behind NZ First at $26 billion. Labour’s spending amounts to $11,828 per household compared to $15,062 by NZ First. Elsewhere, the Green Party has increased their total new spending promises to $9 billion or $5,215 per household. Their major announcements last week were regional transport policies and new environmental spending funded by a plastic bag levy. The National Party has increased education spending by $290 million over three years and promised $120 million for a new Christchurch sports stadium. Smaller spending includes $500,00 in funding for Winter Olympians and $150,000 to stimulate demand in geothermal energy.